New Delhi: Thousands of Youth held a massive protest on Parliament Street to mark their anger against the ruling BJP government. Youth haling from universities and colleges among the country held a protest march from Lal Qila to Parliament Street in New Delhi. 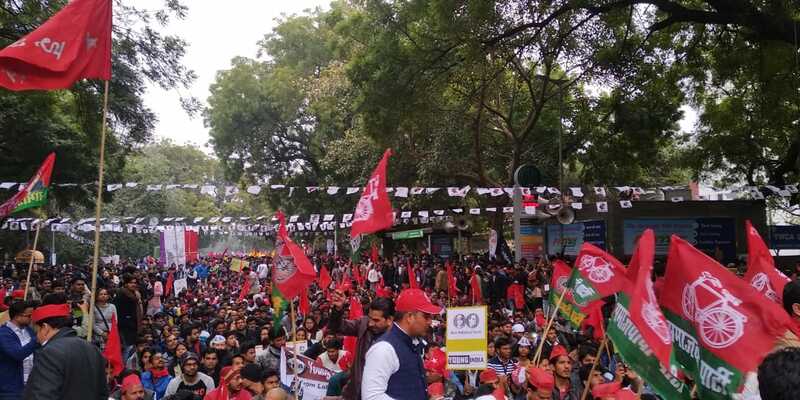 The protest was also joined by Samajwadi party youth’s wing “Chatrra Sabha”, the party supporters participated in the protest march wearing party’s caps and having party’s flags. Several students organisation including All India Students Association (AISA) and Student’s Federation of India (SFI). Other than raising loud slogans, the protester also demonstrated their aggression through plays and songs while other ones portrayed their pain through paintings. Since the protest was joined by nation-wide students organisations, Delhi police has tighten the security arrangements, the roads connecting towards Parliament Street was barricaded and heavy deployment of security personnel were present. The protesters claimed that the ruling get has failed in creating employment opportunities and initiating a war on several institutions. The protest was joined by several political heavyweights including Jignesh Mevani, Kanhaiya Kumar, Deepankar Bhattacharya, CPIML general secretary and Yogendra Yadav. Rahul Gandhi slams Narendra Modi in a fierce speech at Party’s Convention, Dare PM for debate!